Yes, I know that digitalis purpurea is poisonous. The tea I made from spent foxglove blossoms was not for drinking but for dyeing. Dyeing, not dying. Digitalis has to be ingested in a toxic amount in order to do damage. I’d only dyed a small sample skein but I disposed of the 0.2 ounces of blossoms carefully. No sense taking any chances. Once the dye bath was exhausted I carefully poured out the remaining contents in spots at the back of the garden. I’ve been searching for a plant-based source of green dye that doesn’t require the 2-step yellow-dipped-in-indigo method. It’s funny that in a world filled with glorious greens, few plants give a light-fast green shade in the dyepot. I love the indigo produced greens but I wanted something quicker for a tapestry I’ve been contemplating. I was inspired to try another possible green source a few days ago. I saw an old blog post where a dyer was showing off a beautiful pea green skein of wool produced by foxgloves with alum mordant. Well, conveniently, there were several foxglove plants in our garden who had flopped over in the recent rain and were shedding most of their flowers. I went out Friday evening and gathered as many flowers as I could. I passed over the completely brown and slimy ones and ended up with a handful of mostly purple blossoms. A 0.2 ounce handful, as I mentioned before. And, just as conveniently, I had a tiny 0.2 ounce skein of white babydoll southdown yarn that was ready to go into the dyepot. With such a small amount there was no sense using any of my dye pots. They’re far too big and I wanted to do this quickly. So I found a plastic jar with a lid and put the kettle on to boil. The foxglove blossoms went into the jar and I poured enough boiling water over them to cover both flowers and yarn. 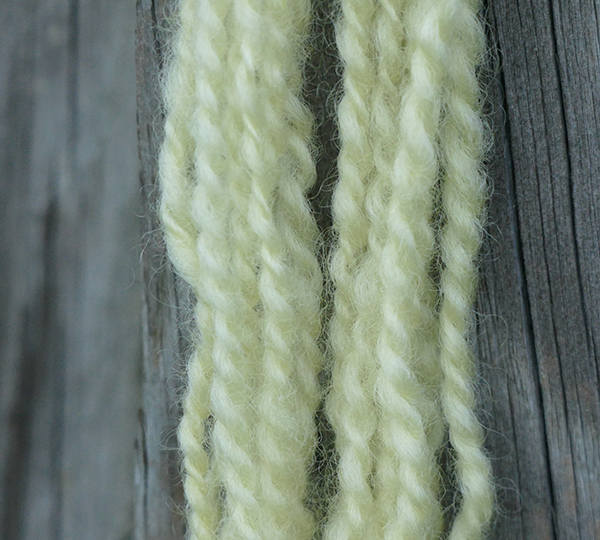 A green-gold colored liquid immediately began to steep so I quickly added a dash of alum and the sample skein. I left the jar on my worktable and didn’t check on it until Saturday evening. No green, but it did yield a clear, lovely yellow. It’s beautiful, but not what I was hoping for. Perhaps it’s because I did two considerably different things from the original dyer. I used equal weight yarn and dyestuff while she used something like a 5 to 1 ratio. She also simmered her yarn in the pot for an hour while I merely made tea and let it cool for 24 hours. And then there’s the fact that our well water is somewhat alkaline. I may try this experiment again later in the summer when we have a second flush of foxglove blooms. I’ll use more blossoms and check/adjust the dyebath for pH.